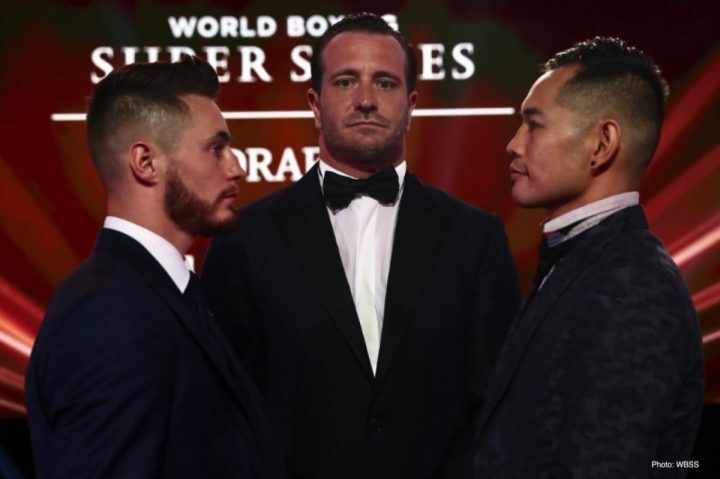 By Allen Fox: WBA Super World bantamweight champion Ryan Burnett (19-0, 9 KOs) has picked former four division world champion Nonito Donaire (38-5, 24 KOs) for his quarter-finals match in the World Boxing Super Series (WBSS) tournament in September or October. In an interesting move, Burnett and Donaire ate dinner together after the selection process by Ryan. That was an unusual move by the 26-year-old Burnett. If it helps him win the fight, then perhaps it was worth it. Burnett needs to start thinking of a good plan for him to take away Donaire’s offensive fire power, because right now the fight does not look like a good style match-up for him. Donaire is smart, experienced, fast and powerful. Donaire is everything that Burnett is not. The only things Burnett has going for him is his youth, WBA title and likely the hometown advantage. Burnett will need to grapple all night long to keep Donaire from throwing punches for him to have a chance of winning this fight. Even if Burnett does that, he’s still going to have a difficult time to try and win. Burnett losing to an accomplished fighter like Donaire isn’t quite as bad if he were to lose to the likes of other WBSS tournament B-side contestants Mikhail Aloyan, Juan Carlo Payano or Jason Maloney. Those are all beatable guys, but still very tough opponents for a fighter like Burnett, who has never beaten anyone that you can call a high quality fighter. Donaire will need to drop down two weight classes for him to face Burnett at 118 for the WBSS tournament. It’s going to be difficult for Donaire to make weight, as he’s complained in the past that it’s hard for him to make the super bantamweight division at 122 pounds, which is why he moved up in weight to the 126 lb. weigh class five years ago in 2013. Donaire has fought five out of his last nine fights at featherweight. The other four fights took place at 122. Donaire is coming off of a 12 round unanimous decision loss to interim World Boxing Organization featherweight champion Carl Frampton on April 1 in Belfast, Northern Ireland. This could backfire on Burnett if Donaire is able to make the 118 lb. weight limit without being weight drained. If Donaire is able to make the weight for bantamweight, he’s going to be devastatingly powerful and faster than anyone that Burnett has ever fought before during his five-year pro career. This could be over with quickly if Donaire is strong at 118. Donaire was quite effective when he fought at bantamweight in 2010 and 2011, winning three fights against Wladimir Sidorenko, Fernando Montiel and Omar Narvaez. Donaire would have dominated for years if he had stayed at bantamweight. Now that Donaire is going back to bantamweight at age 35, his power is going to make him a real threat to Burnett. This could be a minor upset if Donaire wins. You can’t call it a major one because Burnett is still an unproven fighter despite having previously held two world titles at 118. Burnett won the titles against less than the best opposition in defeating Zhanat Zhakiyanov and Lee Haskins. Those guys held titles at 118 when the division was weaker. You now have solid champions in Zolani Tete, Emmanuel Rodriguez and Naoya Inoue. It’s questionable whether Burnett could win a world title at bantamweight if he had to fight one of those guys. Burnett’s 12 round unanimous decision win over Zhakiyanov last year in October, he used constant clinching and wrestling to keep him from throwing punches. The referee didn’t take points away from Burnett, but you can argue that he could have done so because the entire fight was filled with holding and wrestling on Burnett’s part. It’s likely that Burnett will go back to those same strategies for the fight against Tete. The one thing that jumps out at you in looking at these four quarterfinals fights is how one-sided most of them are except for the Burnett vs. Donaire fight. Tete has a huge advantage over Aloyan, and the same goes for Emmanuel Rodriguez against Jason Maloney and Naoya Inoue vs. Juan Carlos Payano. Those are fights where the champions are all going to win. The only fight of the eight-man tourney that has any chance for an upset in the quarterfinals is the Burnett-Donaire fight. You’ve got to respect Burnett for picking Donaire out rather than the likes of Maloney, Payano or Aloyan. Burnett could have taken a relatively soft opponent and improved his chances of winning his quarterfinals fight. But if Burnett had done that, he wouldn’t have a built in excuse to use to his boxing fans if something were to go wrong and he were to lose. Explaining away a loss to Donaire wouldn’t be nearly as difficult for Burnett to do as it would be for him to talk about a defeat at the hands of the B-side opponents in the tourney. It would be difficult for Burnett to do. The winner of the quarterfinals matches in the World Boxing Super Series tournament will set up some mouthwatering fights in the semifinals. It’s going to get really interesting when Inoue, Tete, Donaire, Rodriguez or Burnett wind up facing each other. When you take away the B-level fighters from the tourney, you’re left with the more talented fighters. The tournament winner is going to be considered the best fighter in the 118 lb. weight class by boxing fans. Unlike the 140 and 168-pound weight classes, there was full participation from the top fighters in the bantamweight division when it came to agreeing to fight in the World Boxing Super Series tournament. The best bantamweights wanted to fight in the WBSS tournament. That didn’t happen at light welterweight or super middleweight.